Khalil, C. (2018). The State of the Practice of Agile and Plan-Driven Approaches in ICT Development Projects: An Exploratory Research Study. 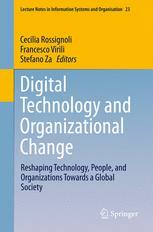 In Digital Technology and Organizational Change (pp. 25-33). Springer, Cham. The number of research studies and surveys on software project management is constantly growing. However, the state of the practice of software project management methodologies is still disparate and confusing. Therefore, project teams are often confused by whether or not they should adopt agile methodologies, or keep on working in a “traditional” way. Given this focus, this research aims at understanding, through different expert perspectives, the challenges and success factors encountered in different types of ICT projects. We adopted a qualitative research approach based on semi-structured interviews with senior project management consultants. Consultants are involved in different kinds of ICT projects: agile and plan-driven projects. The research paper has important implications for practitioners and academics. Findings show that the nature of the reported problems varies depending on whether the teams are working in an agile or in a traditional environment.